We offer wireless LED uplighting, pin spotting, color wash lighting, and custom projection for all occasions. Our LED fixtures can transform your venue from beautiful to amazing and spectacular! For a fraction of the cost of flowers, you can magically paint the room with vibrant colors or you can choose a natural white light for that subtle elegance. This is one of the best ways to create a memorable impression for your guests. 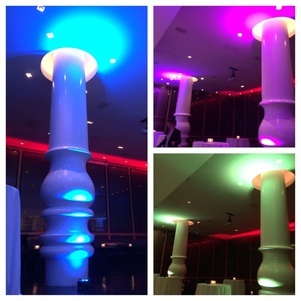 We will create a lighting design that will add that "WOW" factor to any event! A personalized wedding Gobo is an image of the bride and groom’s name, monogram, or initial that can be projected anywhere via our programmable lighting fixtures. Your Monogram or Initials projected on a dance floor creates a focal point which your guests naturally gravitate to, dance around, and offers unique photo opportunities.